If you have been searching online for ways on how to get rid of indigestion, knowing what indigestion is and what causes indigestion would be a good start. Indigestion is a name used to cover many conditions of the gastroesophageal tract. Heartburn and indigestion are often terms that are used interchangeably. But indigestion can also cover inflamed or irritated stomachs . Indigestion is that bloated, acidic feeling that you get in your stomach. It usually is an indication of other problems associated with your gastrointestinal system. Occurring during or after eating, indigestion can cause several uncomfortable symptoms. Gas can be released by flatulence, burping or belching. Indigestion is often caused by poor eating habits. Changing these habits is how to cure indigestion. What Are Some Common Causes of Indigestion? Ulcers are a major cause of indigestion in many people. 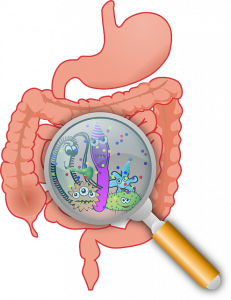 When the stomach acid of the body is not balanced or when there is a hole in the stomach’s lining, an ulcer can occur. The pain from an ulcer is generally severe and gets worse after a meal. This pain is generally present in the sternum area and is in fact heartburn. Stress is our body’s reaction to tension and the reactions that we have to the problems in our lives. When we are upset and experiencing tension, the stress hormones are released in the body and begin to affect its systems. Muscle cramps and severe indigestion can occur. Gastroesophageal reflux disorder is a condition in which the stomach acid will travel back up into the throat area. This can cause indigestion with an intense burning sensation. One of the most common causes of indigestion that occurs in people infrequently and on a milder level is an incompatibility with certain foods. An allergic reaction to certain foods can cause you to experience heartburn. When the enzyme levels of the body are unbalanced, there are not enough digestive enzymes to break food down completely, and indigestion can occur. – Maintaining a healthy weight is the beginning. People who are overweight suffer from indigestion due to internal pressure. – Exercise is another form of an indigestion home remedy that you can start with. It is good to bring oxygen and blood to the stomach to aid digestion. – Meals should be eaten at least two to three hours before bedtime. – The size of meals should be reduced since heavy meals are a leading contributor to indigestion. – Diet should be modified to lower the amount of high fat foods being eaten. – High fat foods sit in the stomach longer. Eating them in smaller portions with fruits and vegetables will help. We believe that many health conditions like indigestion can be dealt with and handled with proper nutrition and help from a qualified practitioner. In our office, we offer a personalized health improvement program called Nutrition Response Testing. Nutrition Response Testing addresses your own body’s imbalances and corrects its operation – safely, naturally and effectively. When you put it to work along with your health improvement program, your body quickly starts returning to that wonderful state of balance we all strive for. You can call for a consultation with one of our Nutrition Response Testing practitioners’ specialists that can help you answer some of the questions you may have about indigestion. Call Rockwall Health Center at (469) 769-1009 to schedule a visit.